On 12 March 2019 some 70 people gathered in New York on the margins of the 63rd Commission on the Status of Women to discuss “The Centrality of Gender Equality to National Cohesion and Sustainable Peacebuilding.” The aim of the event was to raise awareness about the IDPS’ new Vision, one of whose thematic focus areas is advancing gender equality and the Women, Peace and Security Agenda to further the delivery of SDG 16+. The event was supported by ministers from Canada, Sierra Leone and Somalia as well as by the First Lady of Sierra Leone, Fatima Maada Bio. Hon. Maryam Monsef, Canadian Minister of International Development and Minister for Women and Gender Equality highlighted that women’s inclusion leads to longer lasting peace processes in conflict-affected countries. Read more. Hon. Nabeela F. Tunis, Sierra Leone’s Minister of Planning and Economic Development noted that women’s participation in public life contributes to conflict prevention in g7+ countries. Read more. First Lady of Sierra Leone Fatima Maada Bio spoke of the need for women to be engaged at the highest levels of decision-making in all countries. Visaka Dharmadasa, representing the Global Partnership for the Prevention of Armed Conflict (GPPAC), appealed to donors and governments to finance and support women’s participation in peace processes, peacebuilding, conflict prevention and post-conflict reconstruction. Anne Kwakkenbos, representing Cordaid, spoke of the need for greater representation of women, citing the example of the peace negotiations taking place in Doha with the Taliban with no women present. She delivered a statement on behalf of the Afghan Women’s Network calling for full, equal and meaningful participation. Read more. Watch her powerful video message online. What did we learn from the event? Transitions from conflict can provide unique windows of opportunity to promote gender equality and women’s empowerment. In Somalia, ongoing efforts to develop a new constitution and electoral laws, for example, have the potential to significantly increase women’s rights, not just today but for generations to come. In March 2019, 300 women from across Somalia joined hands to press their demands in a Women’s Charter. In conflict-affected countries in particular there is a strong link between the delivery of SDG 5 (on gender equality and empowerment) and aspects of SDG 16 (on peaceful and inclusive societies). As Minister Deqa Yasin said: “Combining SDG 16 and SDG 5 is not just important, it is a necessity. Peace, justice and strong institutions are not sustainable if we do not involve 50% of the population.” Furthermore, the delivery of sustainable peace and stability over the long term will create the necessary conditions for the delivery of all the other SDGs, as envisaged in SDG 16+. Women’s inclusion in peace negotiations is still seen as extraneous. During peace negotiations led by men, women seeking to be included may be urged not to risk harming fragile negotiations by insisting on being involved. “Don’t rock the boat,” was the advice offered to Visaka Dharmadasa in Sri Lanka. Giving women a meaningful voice requires an inclusive consultation process. A people-centred approach to peacebuilding demands that a range of voices are heard from rural and urban areas, different ethnicities and language groups, mainstream and marginalised groups. Misunderstandings abound. A key barrier to women’s participation is the misperception that women come to the table only to talk about “women’s issues”. In reality, women have a right to participate in decision-making that affects their lives. Ensuring women’s participation in peace processes requires practical, flexible and accessible support. A context-based, well informed approach is essential to understand what women need in order to join the conversation. Women’s meaningful participation is blocked in a myriad of ways, including through the denial of visas to women seeking to take part in national peace negotiations hosted by other countries. Very few international organisations exist with the flexibility and means to support women’s meaningful participation. The time has come for action! With the Women, Peace and Security Agenda marking its 20th anniversary in 2020, the time has never been better for concrete action and results. What can we do as a community to advance this global agenda? Improve people’s understanding of how to promote gender equality in fragile contexts. Carry out global advocacy to mobilize international attention and resources for the specific gender equality challenges and opportunities faced in countries affected by conflict and fragility. Push for dialogue and keeping civic space open, especially for women. Advocate on the centrality of gender equality to peacebuilding among those who lack gender expertise. Advocate for women’s participation in peace negotiations and peacebuilding through flexible and easily accessible funding and support. Use the International Dialogue platform to share, learn, exchange and support one another. Strengthening gender equality in conflict-affected states is recognised as being critical to achieving global commitments to sustainable peace. This focus is grounded in a growing body of research indicating that women’s participation in peace processes, and gender equality more generally, is associated with more stable and peaceful societies. Much of this research is showcased in the UN-WB’s seminal Pathways for Peace: Inclusive Approaches to Preventing Violent Conflict report, which recognises that “the degree to which women are included in political, economic and social life is a key factor influencing a society’s propensity for conflict”. Women’s status relative to men’s in a country, especially their vulnerability to violence, is a “significant predictor of the country’s propensity for violent conflict overall”. Meaningful participation of women in peace negotiations results in people being more satisfied with resulting outcomes and agreements, which also tend to be more durable. A study of 82 peace agreements in 42 armed conflicts between 1989 and 2011 tested the emerging consensus that women’s participation in peace negotiations contributes to the quality and durability of peace after civil war. The statistical analysis found a robust correlation between peace agreements signed by female delegates and durable peace. It also found that agreements signed by women showed higher implementation rates. Despite this, between 1990 and 2017, women constituted only 2 percent of mediators, 8 percent of negotiators and 5 percent of witnesses and signatories in all major peace processes. 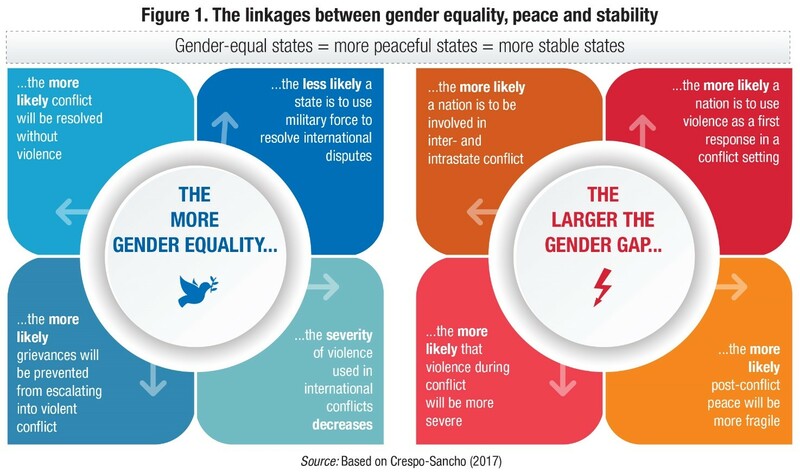 Click here for a visual on the links between gender equality, peace and stability. If you find this update useful, please send the link to others who are working on the delivery of SDG16+.